This Golden Grand Manor 6007 is another example of the fine craftsmanship of KIT Custom Homebuilders. See your local KIT retailer for more information. 3 Bdr / 2 Bath / 2079 sqft. - Huge wrap around kitchen with island. Has cooktop in island and wall oven built into cabinet. Decorative and functional buffet between kitchen and dining room. Home provides large formal foyer. Utility room has provision for optional 1/2 bath. 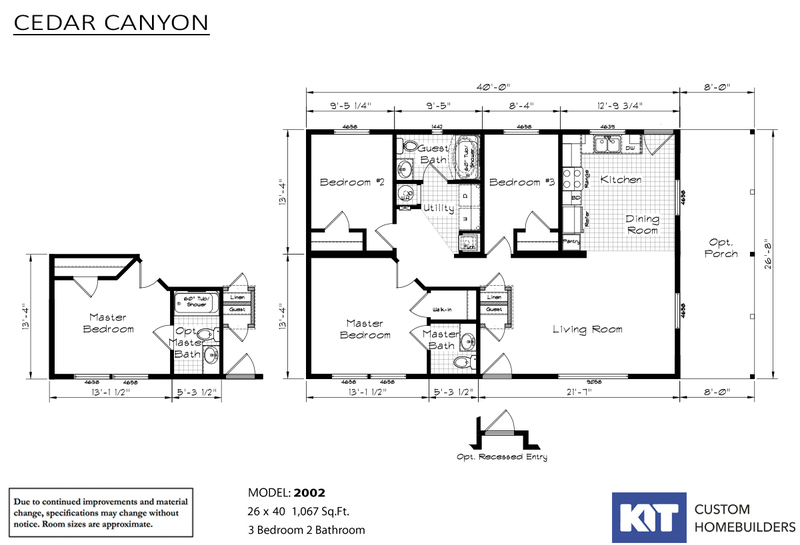 Cedar Canyon 2002 - 3 Bdr / 2 Bath / 1067 sqft. - Eat in kitchen, large living room, flexible with porch option. All Cedar Canyon homes are available is the LS series. Cedar Canyon 2004 - 3 Bdr / 2 Bath / 1280 sqft. - Morning room, separate dining room and a kitchen with an eating bar and lots of cabinet space. All Cedar Canyon homes are available is the LS series. Cedar Canyon 2005 - 3 Bdr / 2 Bath / 1387 sqft. - Great kitchen with sink in island with views through the many windows in the kitchen and dining area. Master bath offers an upgraded deluxe master bath option. Large walk in closet in master bedroom. All Cedar Canyon homes are available is the LS series. 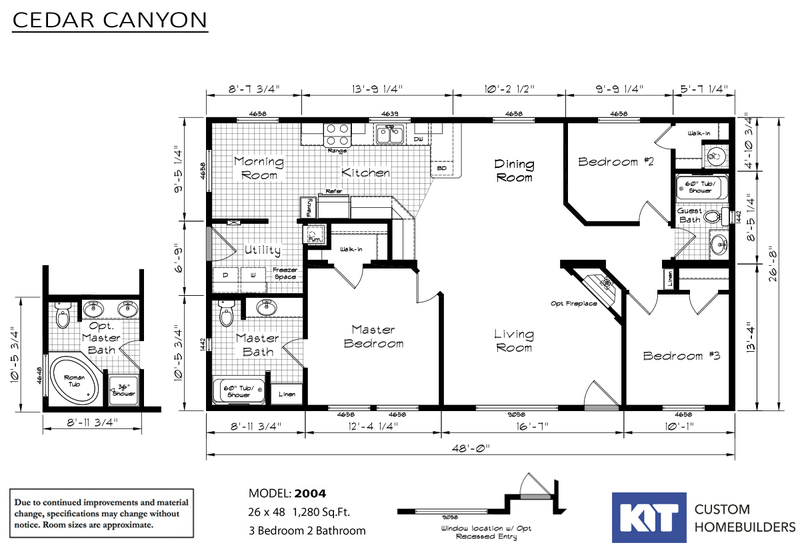 Cedar Canyon 2008 4 Bdr / 2 Bath / 2085 sqft. - Room to roam! This house offers 4 bedrooms, Family Room, Living Room with a central kitchen. Raised snack bar between kitchen and family room. All Cedar Canyon homes are available is the LS series. 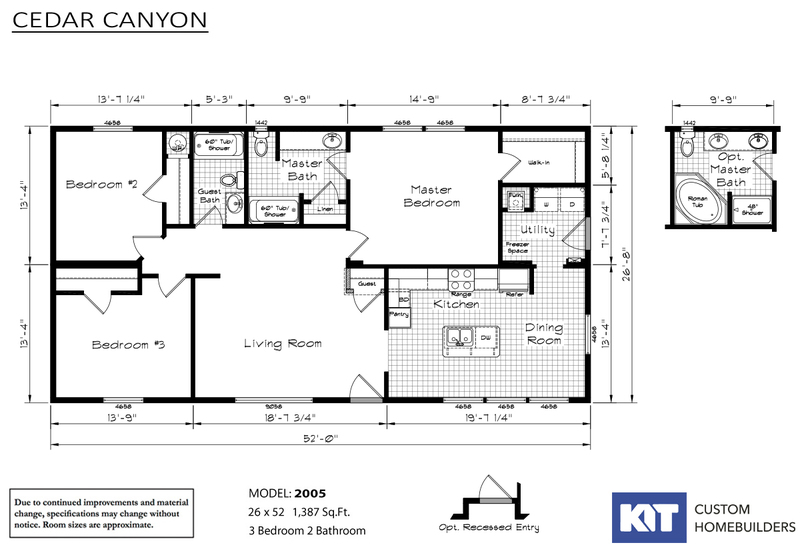 Cedar Canyon 2009 - 4 Bdr / 2 Bath / 1867 sqft. - This comfortable Cedar Canyon home has 4 bedrooms and 2 bathrooms with a very family friendly outline to maximize your space. This home is another example of the fine craftsmanship of KIT Custom Homebuilders. See your local KIT retailer for more information. 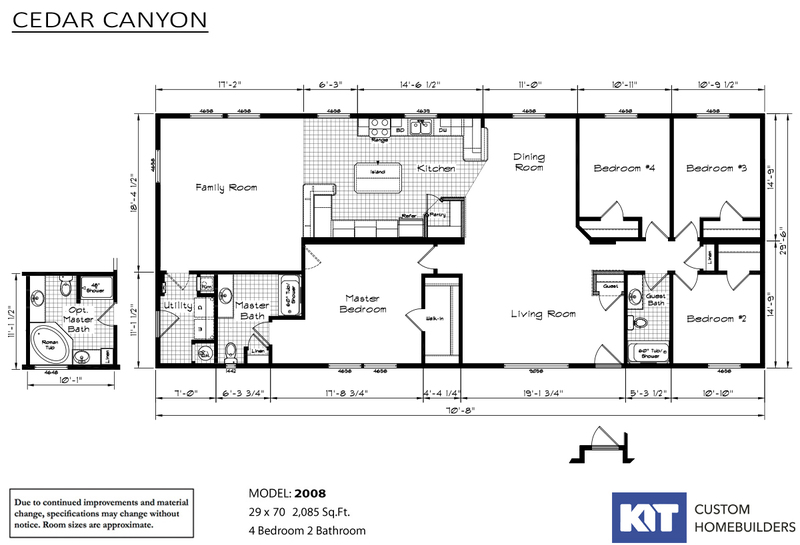 Cedar Canyon 2010 - 3 Bdr / 2 Bath / 1947 sqft. - Home offers Morning Room with great windows for your enjoyment. Kitchen with a convenient island work space. Optional porch can add to fun of living in a home like this. All Cedar Canyon homes are available is the LS series. 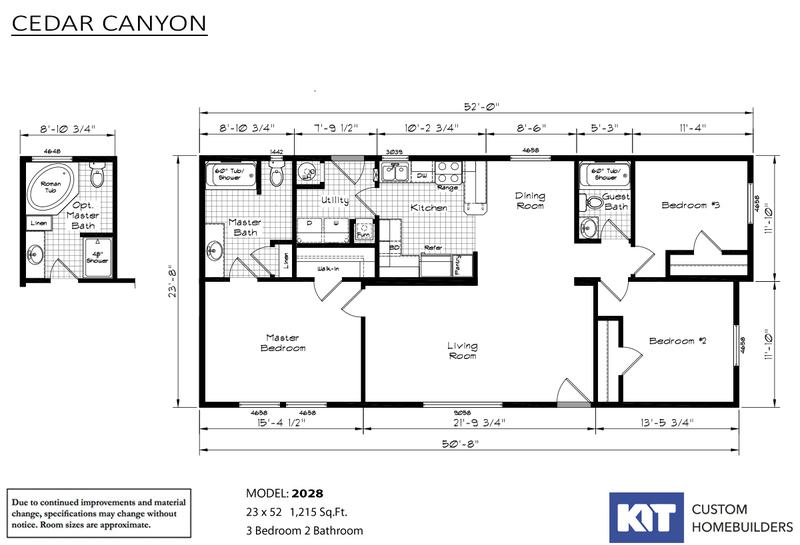 Cedar Canyon 2026 - 3 Bdr / 2 Bath / 984 sqft. - Great home for a park replacement home. Good size living and dining room. Home if offset that allows for an integrated covered porch. All Cedar Canyon homes are available is the LS series. 2 Bdr / 2 Bath / 1023 sqft. 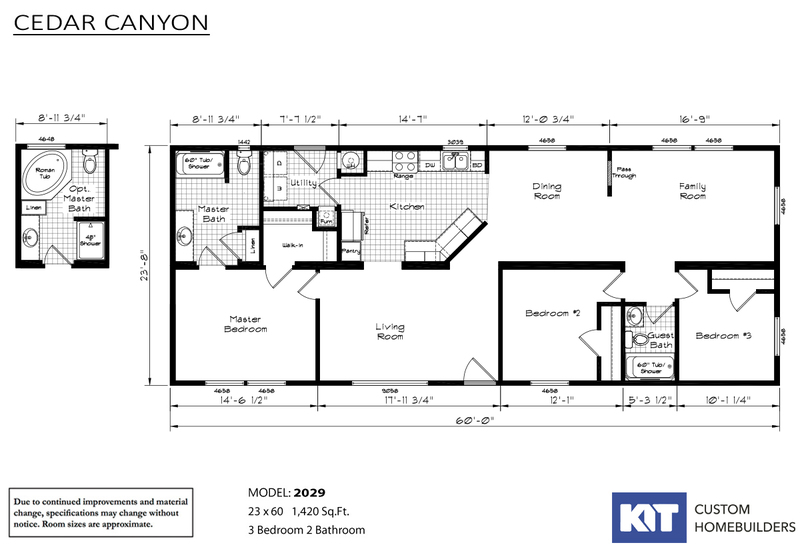 - This Cedar Canyon 2027 is a great way to get your family into a home. This home has 2 bedrooms and 2 bathrooms with options to make the home the way you want it. All Cedar Canyon homes are available is the LS series. 3 Bdr / 2 Bath / 1215 sqft. 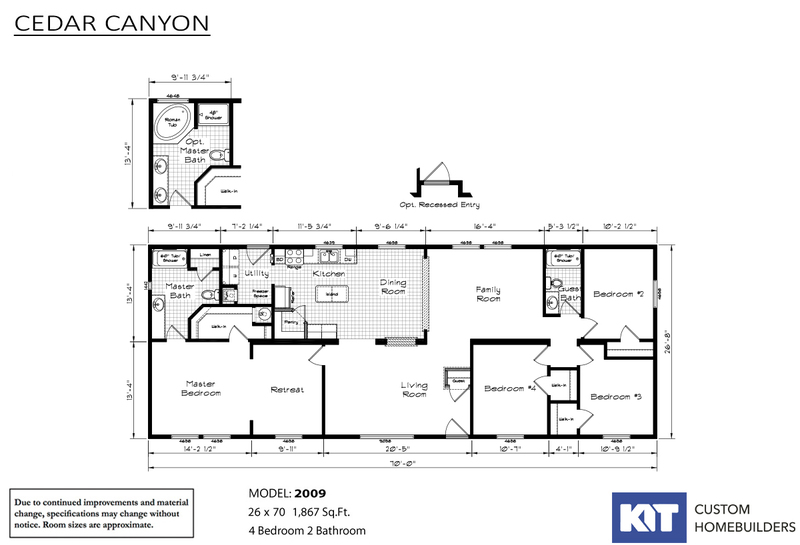 - This Cedar Canyon 2028 has a great layout for some adult privacy in the master suite. This home has 3 bedrooms and 2 bathrooms with lots of living space. All Cedar Canyon homes are available is the LS series. 3 Bdr / 2 Bath / 1420 sqft. 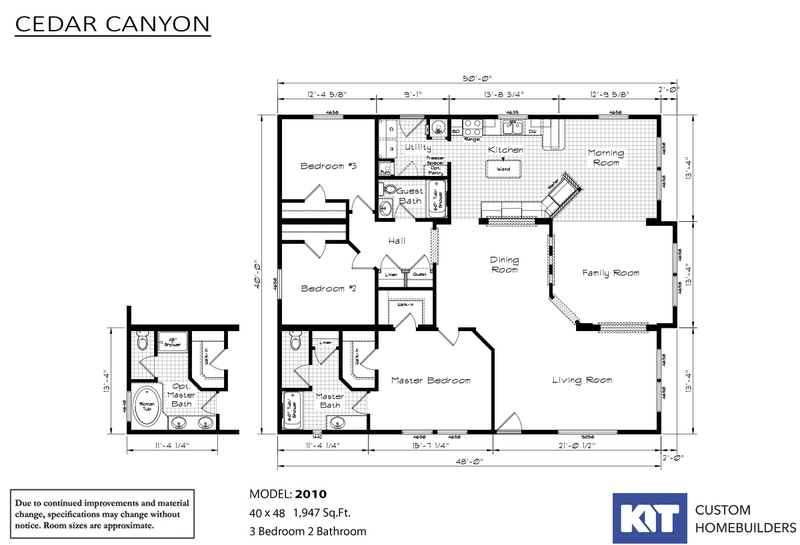 - This Cedar Canyon 2029 is another example of the fine craftsmanship of KIT Custom Homebuilders. See your local KIT retailer for more information. All Cedar Canyon homes are available is the LS series. All sizes and dimensions are nominal or based on approximate builder measurements. Westwind Homes reserves the right to make changes due to any changes in material, color, specifications and features anytime without notice or obligation. Buying a home from Westwind was a lot easier than we ever imagined. We wish we would have done it sooner! We love our new home! At Westwind Homes we will make sure that whether you are purchasing your next dream home or your starter home you have the best experience around. Whether you already have land or you’re just getting started we can help you with all phases of your building project. Please come meet our highly trained housing specialists so we can help you realize your dreams of a new home.